Posted in: Charleston, Family Circle Cup, WTA. Tagged: 2015, andrea petkovic, angelique kerber, family circle cup, madison keys, quarterfinals. Today’s singles matchups at the Family Circle Cup offer surprises and potential classics. 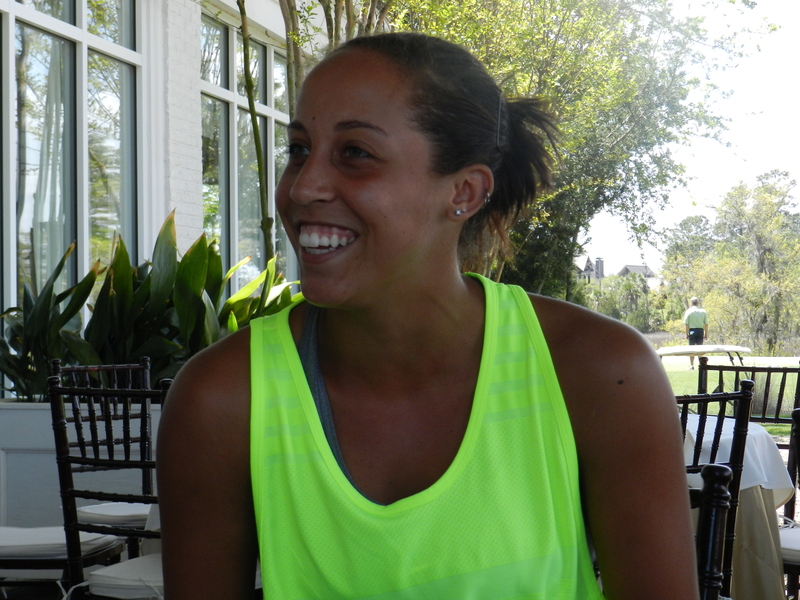 First up is an American battle, Madison Keys, the #7 seed, versus Lauren Davis. Davis benefited from the retirement of Mona Barthel, the #15 seed, while leading 6-4 3-0, in the third round. Madison Keys has had a relatively easy route to the quarterfinals. She defeated Andreea Mitu in the third round 6-2 6-0. In press, Davis proclaimed that she knew Keys’ game “like the back of my hand.” Keys, unsurprisingly, didn’t take this very well and it has probably fueled her motivation to beat Davis. The second matchup today will feature Sara Errani, the #4 seed, versus the surprise qualifier Lucie Hradecka. 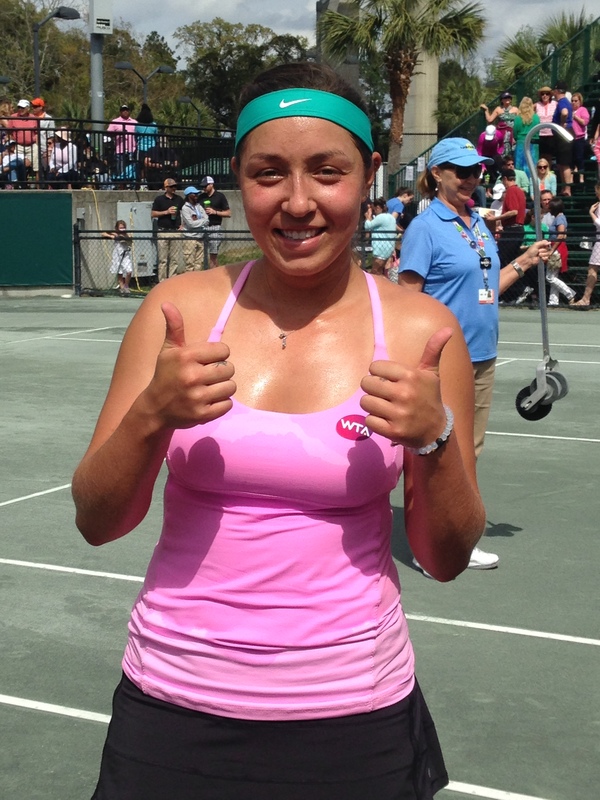 Hradecka defeated Caroline Garcia, the #8 seed, in a marathon in the third round, 5-7 7-5 6-4. Errani also survived a bit of a marathon yesterday. She defeated Sara Sorribes Tormo 6-2 5-7 6-2. The third quarterfinal match features the defending champion and #3 seed Andrea Petkovic, now the highest seed remaining, against the qualifier Danka Kovinic. Kovinic received a gift from her longtime mentor Jelena Jankovic, the #6 seed, who withdrew before their match with a right foot injury. Petkovic avenged her loss to Madison Brengle in the first round of the 2015 Australian Open, their only prior meeting, beating her 6-4 6-4. The final quarterfinal match will feature Angelique Kerber, the #5 seed, against Irina-Camelia Begu, the #13 seed. Kerber defeated Lara Arruabarrena, the player who knocked Sam Stosur out in a 2-hour marathon, 6-3 6-0. Begu received a walkover from Ekaterina Makarova, the #2 seed, who withdrew after her second round win due to a gastrointestinal illness. Posted in: Charleston, Family Circle Cup, Steve Fogleman, WTA. Tagged: 2015, andrea petkovic, angelique kerber, charleston, family circle cup, Interview, jelena jankovic, madison keys, wta. 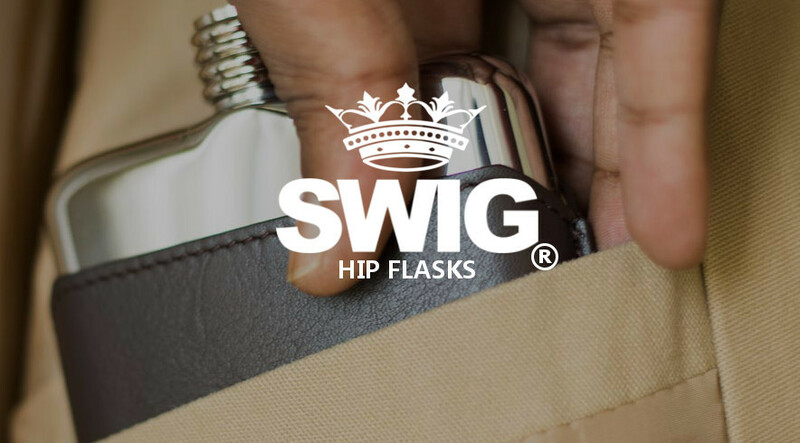 After losing so many seeds yesterday, I thought I’d better post these miniature interviews before another player packed their bags for Fed Cup or Bogota. 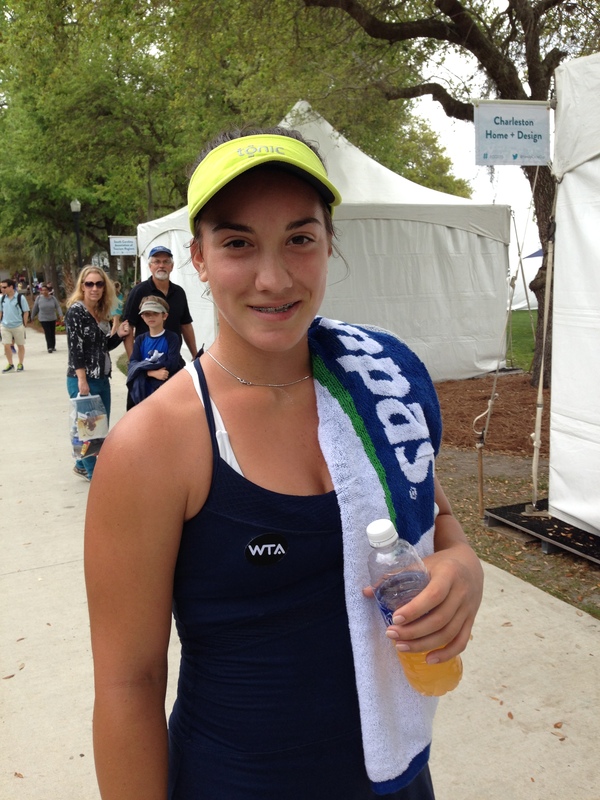 Yesterday, I posted Caroline Garcia and Sara Errani, who survived the Wednesday carnage. Garcia faces Lucie Hradecka this morning and Sara Errani gets Sara Sorribes Tormo this afternoon. Jelena will look to get past Montenegro’s surging Danka Kovinic, who called JJ her childhood idol. Don’t give me any compliments, kid. Sounds like a trap. Madison hopes to continue her winning ways against Andrea Mitu. Angelique draws Lara Arruabarenna this morning on Gibson. And Petko the Giant looks to avoid the upset from Madison Brengle this afternoon. 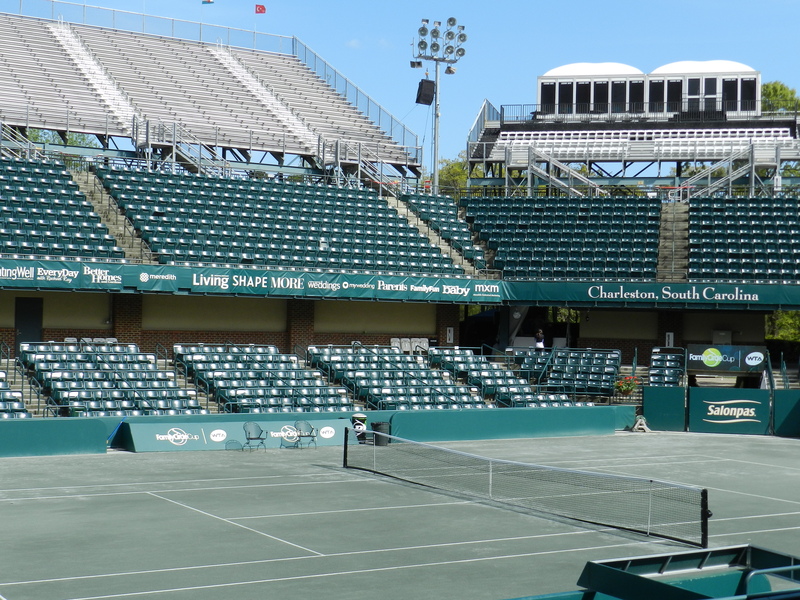 Posted in: Charleston, Family Circle Cup, WTA. Tagged: 2015, charleston, Danka Kovinic, Ekaterina Makarova, family circle cup, Genie Bouchard, Sara Sorribes Tormo, wta. After play on Wednesday, only half of the seeds remain at the Family Circle Cup in Charleston, South Carolina, heading into the third round. Ekaterina Makarova, the #2 seed, began today’s play with a win over Shuai Zhang, 5-7 6-3 6-2; however, a gastrointestinal illness forced her to withdraw providing a walkover for Irina-Camella Begu, the #13 seed, who beat Yaroslava Shvedova today 6-0 6-7(4) 6-4. Begu is the first player into the quarterfinals with the walkover. In a shock, Lara Arruabarrena beat fan-favorite Sam Stosur today, 6-3 3-6 6-4. Arruaberrena will play Angelique Kerber, the #5 seed, who won yesterday. The winner of this match will play Begu in the quarterfinals. American Madison Brengle had an excellent win today over Donna Vekic 6-1 6-3. Vekic had knocked out Heather Watson, the #16 seed, in the first round. Brengle next faces Andrea Petkovic, the defending champion and #3 seed, in the third round. 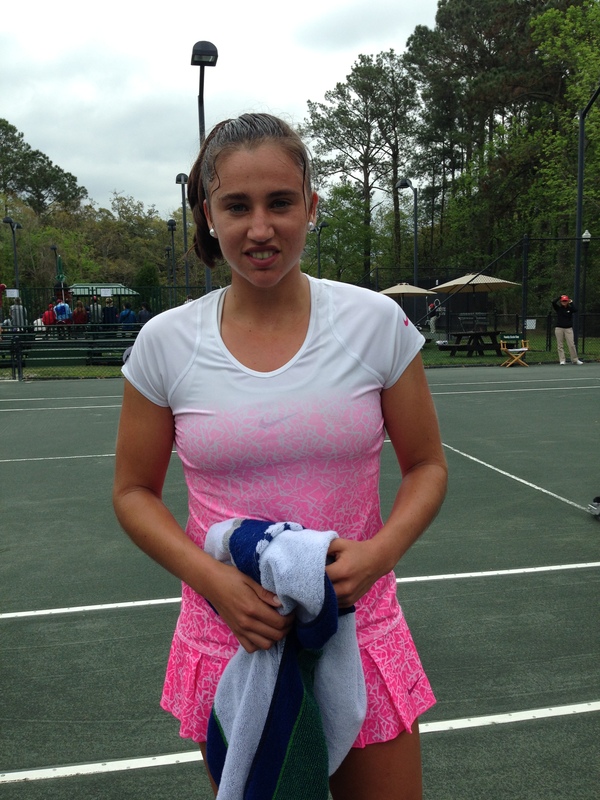 A surprise in the third round is Danka Kovinic. She beat Belinda Bencic, the #12 seed, 4-6 6-3 6-2, and will face her idol and Jelena Jankovic, the #6 seed. As expected, Caroline Garcia, the #8 seed, is into the third round and will face the surprise qualifier, Lucie Hradecka. Sara Sorribes Tormo, also a qualifier, has made it to the third round and will face Sara Errani, the #4 seed who beat Jana Cepelova, last year’s finalist, today 6-3 7-6(5). The one seed to have a seemingly easy time getting to the third round is Madison Keys, the #7 seed. She beat Kateryna Bondarenko, a qualifier, today 6-2 6-1. Keys next faces Andreea Mitu. Mona Barthel, the #15 seed, beat fan-favorite Sloane Stephens today 6-3 7-6(2). She next faces Lauren Davis who knocked out the #1 seed Eugenie Bouchard today 6-3 6-1. Posted in: Charleston, Family Circle Cup, Steve Fogleman, WTA. Tagged: 2015, charleston, family circle cup, Italy, Sara Errani, Womens Tennis, wta. 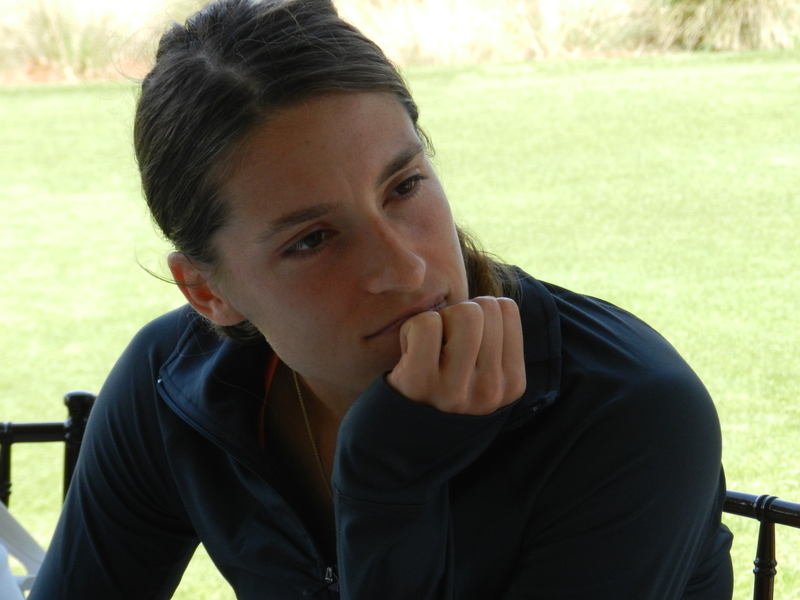 Sara Errani spoke with Tennis Atlantic on Monday in a speed-round interview from the Family Circle Cup in Charleston, South Carolina. Having been granted a first-round bye, she won her opening second-round match moments ago against last year’s finalist, Jana Cepelova. I tweeted a photo of her during Saturday practice which received over 20,000 impressions and wondered what she thought about her army of digital fans. “I have fun with them. There are a lot of good people and fans suporting me so it’s noce to have them when you go around the world to play matches. “I hope so. Here it would be tough. It’s not easy to play on this (green clay) surface, but I’m really happy to start the clay season”.